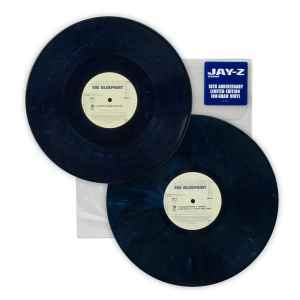 Limited Edition, numbered, double, blue vinyl of The Blueprint exclusively in his Official Store. Limited to only 2001 copies. Tracks D2 and D3 are not credited on the sleeve. Items are shipped from Montreal, Canada. Please read and understand the following shipping & payment terms before placing your order. For LP / 12" orders weighing over 1kg (typically more than 3 records), please contact us for a quote. Please contact us for a shipping quote on orders of more than six 7" records. Canada (all provinces): $4 (no card stiffeners, shipped as lettermail in a bubble mailer. If you require card stiffeners see 12" shipping rates above). Please contact us for a shipping quote on orders of multiple Cassettes. No enviamos a México. Nós não enviamos para o Brasil. No enviamos a Centro / Sudamérica. The example above is for one 12" vinyl with a total packaged weight less than 500g, please edit the details according to your specific item. Items will be shipped within two business days of receiving cleared Paypal payment. Please note we do not accept alternative payment methods, and we do not trade (swap). We recommend all buyers read the Discogs guidelines on Financial Responsibility before committing to buy. Payment is expected within 7 days of order placement. Lack of payment after 7 days will result in a Non-Paying Buyer strike against your account. Please note we do not accept orders from buyers with less than 50% positive feedback. This does not affect new Discogs members ("No Feedback"). FR Notre inventaire Discogs est disponible à être récupéré en magasin pour sauver les frais de poste. Seulement placer la commande ici, sur Discogs, pour éviter des délais potentiels. EN Our Discogs stock is available to collect in-store to save shipping costs. Just place the order here on Discogs first to avoid potential delays. For all enquiries relating to Discogs items, please message us directly here on Discogs via the messaging service. It will bring a more swift response than using our email, Facebook and any associated social media websites we use. Please allow 7-28 days for delivery to Canada (depending on province & shipping service). Please allow 21 days for delivery to USA. Please allow 31 days for delivery to Western Europe (usually delivered in 14 days, but depends on customs / local postal service). Please allow 45 days for Airmail delivery to Australia (again, customs can withhold packages). If your item does not arrive within these timeframes, please message us on your order page before leaving final feedback ("Will you please rate your recent order"). We can also offer a cheaper international shipping method with Canada Post's Surface Mail option (N/A in USA). Message us for a quote. Please note that items may take up to 12 weeks to be delivered with this method. All items are visually inspected under strong lighting. We try to grade conservatively. On some items you may see us mention "EX", or "Excellent". We use this for items which are almost (but not quite) NM, but are definitely better than VG+. We do not use the Mint grade, except for Sealed items (we have to use Mint as there is no "Sealed" grading option available on Discogs). We don't use Mint for sleeves, even if they are perfect. If your sealed vinyl has issues when opened, please contact us before leaving feedback. We will be happy to work out a solution, but remember we have no physical way of checking the condition of sealed vinyl. The shrinkwrap on sealed items (plus generic CD / Cassette plastic cases) are not taken into account with our grading. Due to the quantity of items that we list, we do not usually playtest. A short playtest may be requested for high value items. Please note that we cannot provide soundclips of vinyl. If you are unhappy in any way with your item, you can ship it back to us for a refund. All we ask is that you ship it back to us as you received it. Refunds will be granted upon receipt of the returned item, and will entail the sale value of the item. Buyers are responsible for return shipping costs. Housed in original PVC sleeve with hype sticker. #0736/2001. Heavy item (+500g).